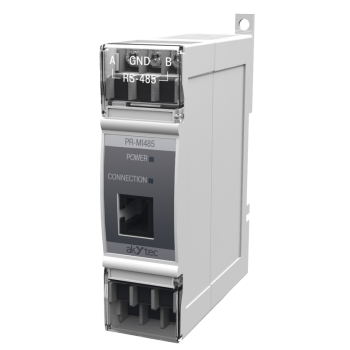 The interface adapter PR-MI485 is intended for connecting programmable relays of PR1XX series to any RS485 network as Modbus-Slave and is designed for DIN rail mounting. The interface adapter PR-MI485 is designed for connecting programmable relays of PR1XX series to any RS485 network as Modbus-Slave. The PR-MI485 doesn't require any auxiliary power supply unit and is powered directly from the relay over the cable (included).